CHISINAU, Moldova -- A new showdown is looming over former Soviet states’ ties to Europe — the same trigger that has ignited months of violence in Ukraine. 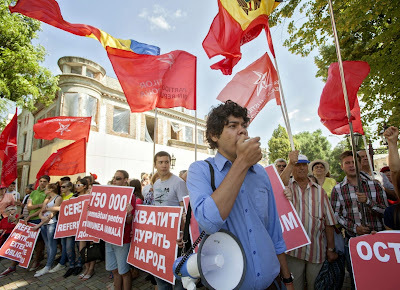 Members and supporters of the Socialist Party of Moldova protest against the Association Agreement between Moldova and E.U. in front of the US Embassy in Chisinau, Moldova on June 25. With some of those states planning to sign a landmark deal Friday that will draw them closer to the European Union, the Kremlin is beaming out urgent warnings about the consequences. Russia has said it will flex its considerable muscle to squeeze any nation in the former Soviet orbit that seeks a future with Europe. Ukraine, Moldova and Georgia are facing intense pressure ahead of the deal’s signing, including threats of export bans and tightened immigration rules, as well as the specter of strengthened separatist movements. But the warnings may be backfiring, with leaders in all three countries saying Moscow’s ominous tone demonstrates more than ever why they need to pick a different path. In Moldova — where decaying 19th-century mansions in the capital, Chisinau, testify to the once-grand heritage of Europe’s now-poorest nation — leaders say they are committed to the agreement, even if it makes their nation more impoverished in the short term in the event of a Russian backlash. Many in this rural country, where annual economic output amounts to $3,800 per person, expect Moscow to follow through on warnings that it will ban Moldovan crop exports and expel some of Moldova’s large expatriate population in Russia. Many officials also worry that pro-Russian separatist movements will be energized in breakaway regions of this nation of 3.6 million people. Russia’s threats have hardly been subtle. After a visit in May to the pro-Russian breakaway region of Transnistria, Russian Deputy Prime Minister Dmitry Rogozin threatened to return in a plane armed with nuclear weaponry after his official jet had difficulty securing airspace permissions for his return flight. Last year, ahead of winter, Rogozin told Moldovans that “I hope you don’t freeze,” a reference to their country’s complete dependence on Russian natural gas, which is used for heating and which Moscow has sometimes cut off during political disputes. And in September, Russia declared that Moldovan wines did not meet Russian food-safety standards, removing access to a major export market for a key Moldovan industry. Wines from pro-Russian autonomous regions of Moldova have been deemed safe for Russian palates, however. Many Moldovans are convinced that the apples and grapes that grow on their nation’s gently rolling hills are the next targets. Russia is their main export market, and E.U. regulations will keep most of the fruits out of Europe even after the agreement is signed. Moldovan leaders, elected in 2009 on a pro-European platform, have said that after 23 years of post-Soviet life within Russia’s orbit, they are not convinced that they are the better for it. “Since Moldova’s independence, it became, unfortunately, the poorest country in Europe, with the lowest salaries and pensions, with the highest gas prices,” Moldovan President Nicolae Timofti said in an interview. So, he said, “there are advantages and disadvantages” to being a member of the Russia-dominated Commonwealth of Independent States, an association of former Soviet republics. The Moldovan public is evenly split in its support for building ties with the E.U., opinion polls show, and politicians say they want to maintain relations with Russia as well. Overall, 26 percent of Moldova’s exports go to Russia and 47 percent to the European Union. “We don’t want to protect ourselves from Russia. We believe that our relationship with Russia should be developed with the respect of sovereignty. Our interest is one thing — to develop Moldova,” said Deputy Foreign Minister Iulian Groza. “But we don’t believe that by constraint you can force someone to marry you,” he added, alluding to Russia’s attempts to keep its neighbors at its side. Fears of an outright Russian invasion have eased since March and April, when 40,000 Russian troops massed along the border with Ukraine. As Russian troops seized Ukraine’s autonomous Crimea region, there were concerns that they could roll forward. Officials in Chisinau say they expect newly vigorous agitation from Transnistria, a Soviet throwback where a massive granite statue of Lenin stands in front of the main government building and a hammer and a sickle adorn the flag. Groza and others said they hoped that bolstered E.U. ties also pull Transnistrians westward. As of mid-April, Moldovans can travel visa-free to the E.U. Transnistria residents who have Moldovan passports also will benefit. The upheaval in the former Soviet world started late last year, when Russia began campaigning against former Soviet republics signing the package of economic, trade and political deals with the E.U. known as the Association Agreement, the first step toward membership to the bloc. Russia persuaded Armenia to pull out of its E.U. discussions in September. Then it turned its attention to Ukraine, where President Viktor Yanukovych in November reversed course on plans to sign the agreement. That set off pro-European protests in Kiev and eventually led to Yanukovych’s ouster in February. But Russia’s moves have spurred neighbors to reorient westward even more quickly than they were contemplating. The deal-signing date for Moldova and Georgia was pushed up to June. Ukraine’s new president, Petro Poroshenko, said he wanted to sign at the same time. Other countries with close ties to Russia also have become more cautious about binding themselves to their neighbor. Belarus and Kazakhstan signed a treaty in May establishing the Eurasian Union, Russian President Vladi­mir Putin’s signature attempt to build a Russian-led counterweight to the European Union, but it contains fewer provisions for political integration than he had initially sought. “Russian behavior is irrational. If Russia wants to be able to promote more civilized policy, it had the chance to keep these territories in some soft, non­aggressive manner,” said Oazu Nantoi, an analyst at the Chisinau-based Institute for Public Policy. Russian diplomats have logged many air miles in recent weeks visiting neighbors, including Moldova, to make a last-minute push to preserve relations with Moscow. Russia hopes to minimize the “negative impacts” of Moldova’s new E.U. ties, Deputy Foreign Minister Grigory Karasin said during a visit to Chisinau this month. In Moldova, some in business say that the Russian threats are an impetus for them to modernize in a way they never needed to after the Soviet Union’s breakup. “If Russia were going very well, there wouldn’t have been a logical need to change anything,” said wine producer Sergiu Galusca, who hopes to find customers for the high-quality wines he aspires to sell in the West.